The integral part of workplace team work is the sharing of professional opinions with co-workers. The main beneficial fact of discussing varied view of points at workplace helps in encouraging brainstorming, leads to actual project planning and engenders new ideas. When workers share the best procedures and practices of doing a job in a better way, it would enhance the team’s viability. When co-workers share their ideas the team cohesion, communication and efforts within the team is developed. Sharing ideas with co-workers is always advisable for a number of reasons. 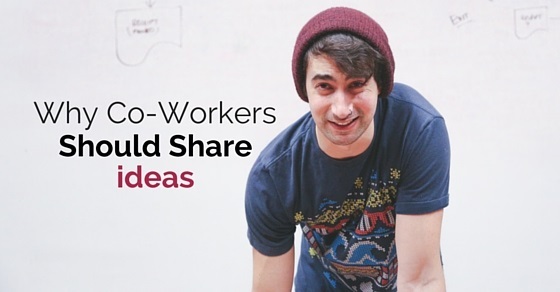 Let’s glimpse through a few ideas and tips about sharing knowledge with co-workers. When a worker shares some ideas with his team mates, creativity is developed amongst the team. When you share ideas you get more thought and ideas, where you also help the other worker to think in a unique way. Enhanced and effective selling solutions are obtained when co-worker shares his ideas to others. By sharing your knowledge you maximize knowledge and help others learn new skills in their career and also helps gain enthusiasm in the work they do. The individual as well as the team’s knowledge is boosted when ideas are shared by team mates. When people share ideas in work place there is collaboration and they work towards the desired goals. The useful fact of sharing idea in work place is that team is taken to a higher level. Sharing ideas within co-workers can be accomplished in a number of ways. Technology has advanced with speed internet, emails, file sharing, video conferencing and lot more to share ideas. When ideas are shared teamwork is enhanced. When employees share their ideas, it is a fact that other workers also get involved in their work. Sharing ideas brings groups together and also paves way for brainstorming new ideas. Sharing knowledge with your co-workers helps them gain an in depth knowledge and hence they can apply in other work related tasks. When you share your ideas, other co-workers will also feel free and share their thoughts and ideas. When you share your ideas and thoughts with other workers you are actually presenting your skills and talents. For example an employee may have trouble with presentation skills, this is where you need to share your idea and help the employee. By this way your higher officials will also get to know your talent. Co-workers should share ideas for a number of reasons where the primary one is to solve any issue that pops up. An individual can take three months to solve an issue, if co-workers share ideas and boost him, the problem can be solved earlier. By this way work is fastened and completed quickly. Helping your co-workers with ideas and making certain things better for them is one way which enhances your morale. When you share ideas with your colleague and support them, you are viewed as an optimistic person and appreciated by others. When you help other workers, you are drawn close to them and they care for you mostly. When an employee shares idea and help others, his own success is brightened with more networking opportunities. Rather than being one amongst the office jerk, helping and supporting others with your thought of sharing ideas offers you with reputation which you need. When you share your ideas and invest in others, you gain a network of people who can assist and enhance you in your career. When co-workers share their ideas with others they are developing leadership skills and qualities. The co-worker is actually helping other workers with his ideas and building the organization as a leader behind the scenes. You earn more respect when you share your thoughts in spite of your official role. Sharing ideas is one way by which one can model and develop value jointly. When ideas are shared with colleagues it is reported that it helps employees to live longer. As employees work round the clock, getting along with co-workers and sharing ideas is vital. It is reported that employees who have less intention to share ideas are 2.4 times more likely to die in 20 years than employees who share ideas with other workers. Psych central also reports that work place stress is diminished and productivity is increased when workers share their ideas with others. The academy of management journal mentions that maintaining ideas within yourself and not sharing as someone would steal them can backfire. It is hence suggested to share your ideas which showcase your talent and creativity. As all work places are being team based these days, sharing ideas can lift up the team. Sharing idea is also a way which impresses your boss and can be beneficial at times of review. Sharing ideas always brings in benefits for the worker. At times of hiring and promoting employees, employers look for team work and interpersonal skills. For the same socializing with the team and sharing ideas with other co-workers is a key aspect, by this way you can either build or break your career enhancement. When an employee shares ideas and helps their co-workers, relationship is strengthened, career opportunities are elevated and reputation is enhanced. It is hence important to share ideas at work place. A mastery climate is where the organization’s main intention is on learning and cooperation. In that manner when a co-worker shares idea with other colleagues, cooperation is developed automatically and learning new techniques takes place. Hence sharing ideas with co-workers is mandatory in all organizations. Sharing ideas in an organization with other co-workers is a good concept which should be followed by all employees without any second thought. Sharing your ideas with others helps develop talent in others and also builds your talents. For example you may be an employee good at creative thinking and your co-worker can be one good at organization and planning. When you share your ideas at time required for your co-workers, they also would help you at times of need. And hence sharing ideas with co-workers is necessary. When you share ideas with employees in an organization trust amongst employees is developed. By this manner strong relationship is maintained irrespective of the scenario. Irrespective of any disagreements that happens in a work place when you help any employee and share your ideas a strong relationship is developed and employees enjoy workplace. In the same manner employees trust you more when you share ideas often at work place. Open communication and encouragement is the key to produce effective results. Hence sharing ideas at work place is mandatory. When a group of unique people are put together there are more chances for conflicts to arise. Employees possess varied habits and work styles as they come from different backgrounds. This kind of work environment helps in developing the most successful work but also have more chances to develop conflicts. The employees are responsible for conflicts that arise in workplace and they are to solve themselves instead of heading the management. When you share ideas in a workplace chances for conflicts are less, employees learn to share from another employee and ego is buried. By this way conflicts are averted and sharing is gained more importance. The academy of management journal has opened up that employees who hide aspects from their co-workers has nothing to do with them, it will just turn the way round and hurt them. The study also suggests that employees should be careful in hiding information from their peers as whatever goes comes back to them. The study has also revealed that employees who do not share their ideas with their coworkers are tagged as self-behavioral employees by their co-workers. By this way the employees are hurt and their creativity is diminished. The above pointers mention why co-workers should share their ideas. The benefits and useful tips by sharing ideas in work place are mentioned. Employees who have not shared their ideas yet can get to know the positive aspects that take place due to sharing ideas. Employees can also develop the same habit of sharing in other employees mind and make the work place a united one. Sharing is a good habit which makes positive approach, develops broad mind, and good attitude. Hence sharing ideas in work place is necessary to make the workplace the best one and also enhance productivity.